Dating: 1st – 3rd c.
Roman site in Batina has been known since the 18th c. Research carried out by Danica Pinterović was the only systematic excavation on sections of the Ad Militare fort. During a field survey of the eastern edge of Bansko Brdo in 2008, the broader area of Batina and Zmajevac was systematically scanned thanks to the joint efforts of experts from the Museum of Slavonia in Osijek, Institute of Archaeology and the Department of Archaeology of the Croatian Science and Art Academy. From 2010 to 2013, a geophysical survey using a georadar and electrical resistance method was conducted in Batina. Headquarters building with an apsidal sanctuary, headquarters apartment, barracks, other buildings (granaries, workshop/hospital?) and ramparts were detected. According to the shape of the ramparts and the buildings inside the fort, it was dated back to the period of Emperor Antoninus Pius (138-161 AD). 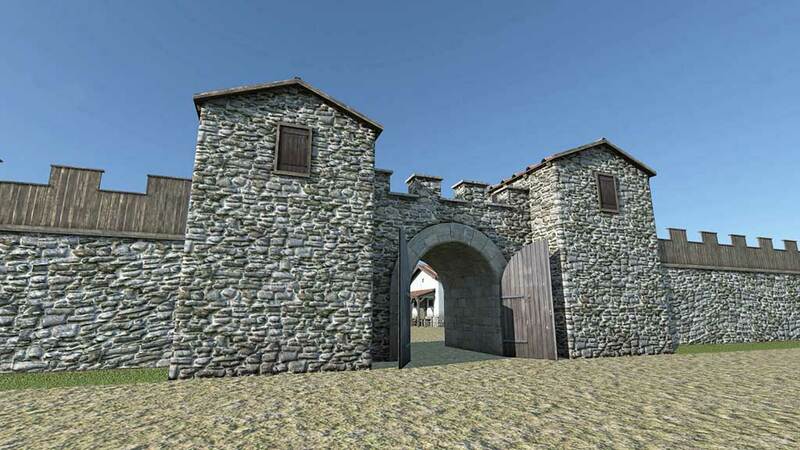 An auxiliary Roman military unit cohors II Asturum is the most likely candidate for the detected building phase of the fort. Also, it is likely that cohors II Augusta Thracum was stationed in the fort, as well as detachments legio II Adiutrix, legio VI Herculia and equites Flavianenses.